It has never been more important to exist in portraits and is the reason why I paint and love photography. After losing my mum to cancer suddenly in 2012, I worked on a tribute video of her life and was shocked by the lack of images I had of myself with her and of her alone. My photography practice became more important than ever and went from passion to career as I felt the need to be a part of creating something special to cherish for others. We never know when we will lose those we care for so please, exist in portraits. For you, for those you love. 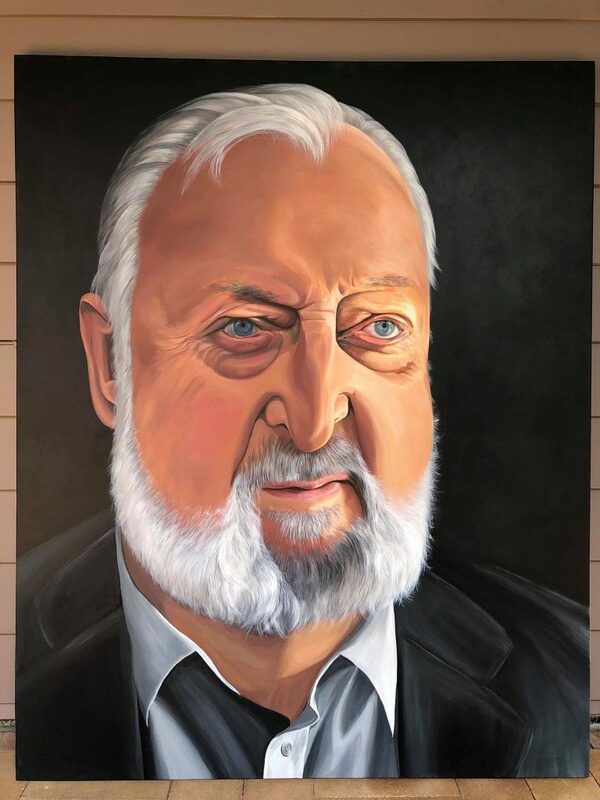 In February I had the honour of the late, great Midday Maestro, Mr Geoff Harvey sit for me for the Archibald. We chatted about his amazing career, his love for his beautiful family and his pure passion for writing and playing music. He was funny, witty and just so very kind to take time out from his busy touring schedule for me and it was an experience I am so truly grateful for and one I will never forget. He played Bach for me while I sketched him and this was so overwhelming to watch as he played with such grace and ease. The music flowed from him so naturally and filled his music studio with such power yet gentleness that was awe inspiring and I hope that my portrait conveys some of the magic of his presence. It is a presence that will be missed by many. 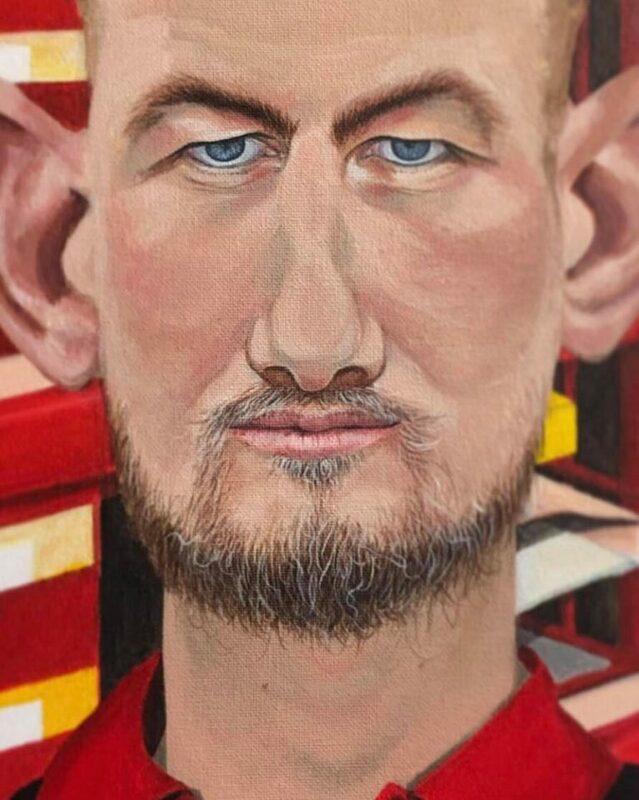 I’m so very honoured to be able to enter this portrait into the 2019 Archibald Prize. During the process of painting this portrait, I created some snaps to show the journey of the painting as it was created… Check them out below. 2019 is set to be a big year professionally for me. With a goal of 9 major art prize entries on the to-paint list its sure going to be a busy one! Its been exciting getting to sit and watch the Australian Open Tennis on some very warm evenings here in the Southern Highlands while painting some very fine details on this piece. 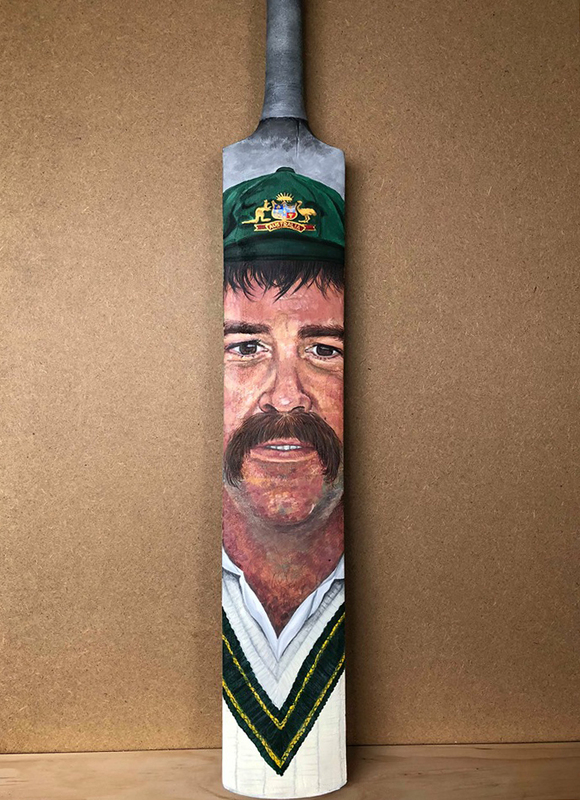 I’m honoured to be involved in an exhibition at the Pavilion at Kiama on Wednesday night where my David Boon portrait will be for sale. This is an exciting event raising funds for Willo Industries in Bowral. Willo Industries is a business that supports a young man, Will, who lives with Autism Spectrum Disorder. Will refurbishes Cricket Bats and then artists, this time round its Kiama Artists, donate their time to create works of art on Wills bats. Kathryn from Beachside Emporium in Kiama has organised a sensational event along with Wills mum Ange and Im so excited to be a part of it. 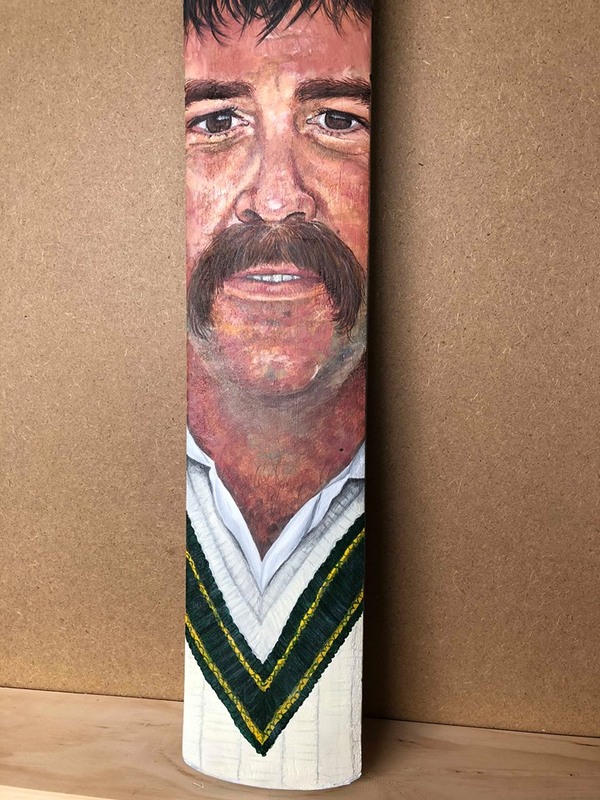 I couldnt think of a better portrait to paint on a cricket bat than of David Boon. Growing up, my mum was ‘in love’ with Boonie. We even had Buttercup stickers on our fridge with his face on it! Mum sure would have loved to have seen this portrait take shape and have been at this event with me on Wednesday! 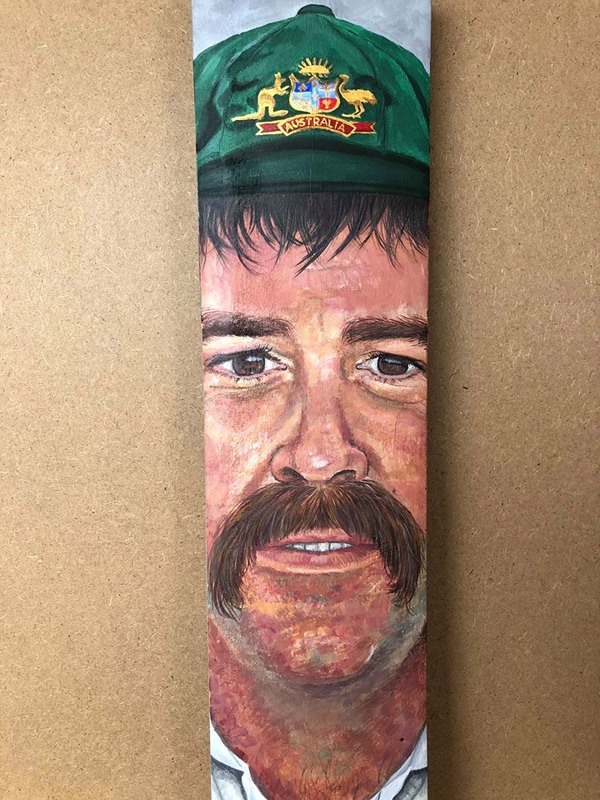 The portrait shows Boonie in his baggy green hat and, although this is a refurbished Puma bat, the rear has been painted to show Boonies signature Gray Nicolls brand that he played with. 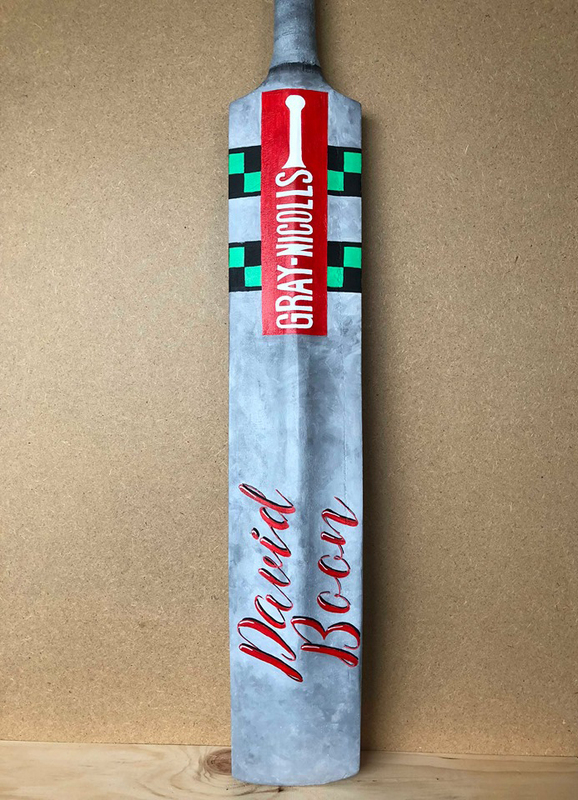 Signed on the side, this bat is painted in acrylics and sealed and would make a sensational addition to anyones Cricket Memorabilia collection or just a unique piece of art to hang in the home!